The machine that will enable cancer patients to receive high energy proton beam therapy (PBT) on the NHS for the first time has arrived. Manchester's Christie hospital will be the first NHS unit to provide the treatment, meaning patients needing PBT will no longer have to go abroad. University College London Hospital (UCLH) is due to open its own PBT centre in 2020. The government has invested £250m into building the two new NHS centres. Currently, only low-energy treatment is available in the UK for rare eye cancers. Last year, the NHS sent 210 patients abroad for PBT - mostly to the US and Switzerland - at a cost of about £114,000 each. The 90-ton machine - called a cyclotron - weighs more than 11 double-decker buses but is no bigger than a family car. The building it will sit in has had to be reinforced with 270 separate timber, steel or concrete posts to support the structure. It uses charged particles instead of X-rays to deliver radiotherapy for cancer patients. The treatment allows high-energy protons to be targeted directly at a tumour, reducing the dose to surrounding tissues and organs. In general, patients suffer fewer side effects compared with high-energy X-ray treatments. It can be used to treat spinal cord tumours, sarcomas near the spine or brain, prostate cancer, lung cancer, liver cancer and some children's cancers. Erin Birdsey from Northwich, Cheshire, who was diagnosed with a brain tumour aged six, was sent abroad by the NHS to the US for PBT treatment. 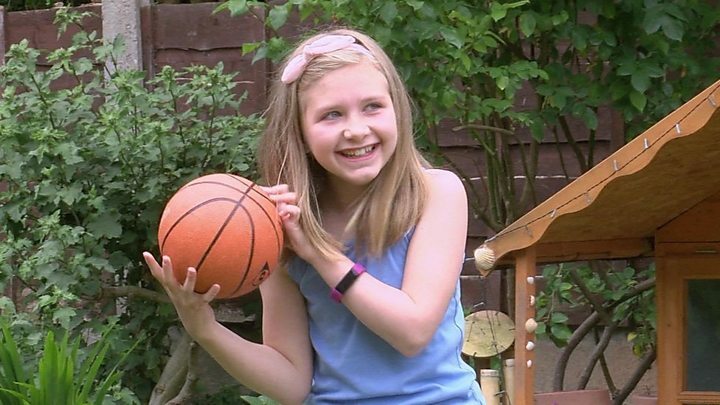 Erin's mum Rachael, said: "At the age she was... to be able to spare as many healthy brain cells as possible, which [PBT] does, it makes such a difference. "To have [PBT] so close to home, and be able to receive that treatment and carry on a lot better than taking 10 weeks out of your life and going to another country, that can only be a positive thing." The use of PBT was highlighted by the case of five-year-old Ashya King, which received global attention in 2014 when his parents were briefly detained after taking him abroad for the treatment. Against medical advice in Southampton, they took Ashya - who had a brain tumour - to receive PBT treatment in the Czech capital of Prague. The NHS ultimately agreed to fund his care. This 90-ton power house is capable of accelerating a proton stream made up of ionized hydrogen gas to two-thirds the speed of light (over 100,000 miles per second). The cyclotron needs to be very cold and uses superconducting magnets cooled by liquid helium -269C and coils of copper wire 30km (almost 19 miles) long. The building sits on 270 separate timber, steel or concrete posts driven into the ground to support the structure. The total tonnage of concrete that will be used for the centre is 48,000 tonnes, the equivalent of two aircraft carriers. The proton beam therapy power station provides enough energy to power the whole of Trafford Park. Professor Tony Lomax, deputy director of the Paul Scherrer Institute in Northern Switzerland, who is originally from Salford, has advised the NHS on bringing the treatment to the UK. 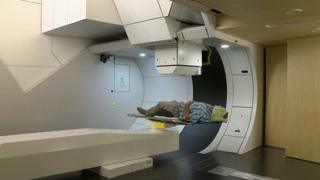 He said: "Probably for some patients modern radiotherapy is extremely good. But with [PBT] we can take on more complicated tumours and with children we really want to reduce the radiation dose to the normal tissue so I think this is where the technique has a fantastic advantage." PBT is also being made available in private clinics in the UK. Proton Partners International (PPI) opened the Rutherford Cancer Centre in Newport in February, and it will be open for PBT early next year. PPI is also building three more proton beam centres - in Northumberland, Reading and Liverpool. Chief executive Mike Moran, said: "We will treat NHS, private medical insurance and self-paid patients. The NHS is planning assumptions on 1% of patients who currently receive radiotherapy requiring proton beam therapy, which is 1,500 patients." However, Mr Moran said he believes a greater proportion of patients need PBT. "We're building a network of centres... It gives patients more choice."